Today while going to pick up Patrick from school, I was tailgated by a car in the school zone. Apparently they didn’t appreciate that I refused to go faster than 20 mph. 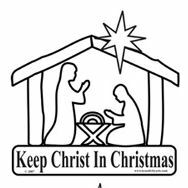 As I went to turn left, it zoomed past me, still in the school zone, I caught the “Keep Christ in Christmas” magnet on it’s rear-end. It made me laugh for two reasons: First is the complete irony of a person who claims to want to keep Christ in Christmas who cannot obey a simple law complete with a total lack of patience. I would bet good money that swearing was involved. Secondly, buying the magnet allowed someone to profit off our Lord and made you buy into the hype. If only it were this easy to just put a magnet on your car and be done with any other obligations. Over and over again, I hear, “It’s not a HOLIDAY tree, it is a CHRISTmas tree.” Where is there a Christmas tree in the Bible? If you have a tree up, you’ve already bought into a secular Christmas. If you buy presents for those who have no need of even one more gift, you’ve bought into a secular Christmas. If you bought a magnet that said, “Keep Christ in Christmas”, you’ve bought into a secular Christmas. I always find “what would Jesus think” a good rule. I often imagine Christ shaking his head when he hears such things, saying, “They do not know me.” I doubt He would even want to have a day of His own where we celebrate His birthday. When I read the Gospels, what I take from them is that we are to be walking the path of Christ every day, not just one day a year. We are to model His example of feeding and clothing the poor, ministering to the sick, being compassionate, being at peace, not making war, forgiving others, etc. If you think writing a check or buying a gift for someone less fortunate meets your obligation for making Christmas about Christ, you would be wrong. Christ would never phone it in. If you are yelling about putting “Christ” in Christmas, how are you spending the rest of the days of the year? Are you focused on things about yourself instead of others? Is it wrong to participate in Christmas then if you participate in both the secular and Christian aspects of it? No. Just stop being a hypocrite about it. 1. Take time to be alone and ponder your relationship with Christ, not only at Christmas, but the relationship you have every day. 2. Read the story of Jesus’ birth and note how people responded, Mary, Joseph, the shepherds, Simeon and Anna. Remember that every other day of the year as well. 3. Praise God at Christmas and join others in celebrations of music and praise. Continue this tradition every week of the rest of the year. 4. Help those in need. Follow the example of Jesus whose heart was filled with compassion for those who were suffering. 5. Keep your “to do” list as short as possible. Limit your social obligations so there is time for reflection. 6. Use cash when you buy gifts to avoid holiday debt. Invite your relatives to support a charity instead of giving you or your family a gift. 7. Tell others about our Savior. 8. Remember Christ’s church (not a particular religion) around the world. Some are enduring great hardships. 9. Live like Christ every day. Be compassionate, forgiving (especially in mall parking lots, SCHOOL ZONES, harassed sales staff, other people being rude and un-Christ-like). Be sensitive to the people in your own life.